What Supplement Is Good for Inflamed Muscles? How Long Does it Take to Heal a Pulled Muscle? Can Herbs Reduce Belly Fat? 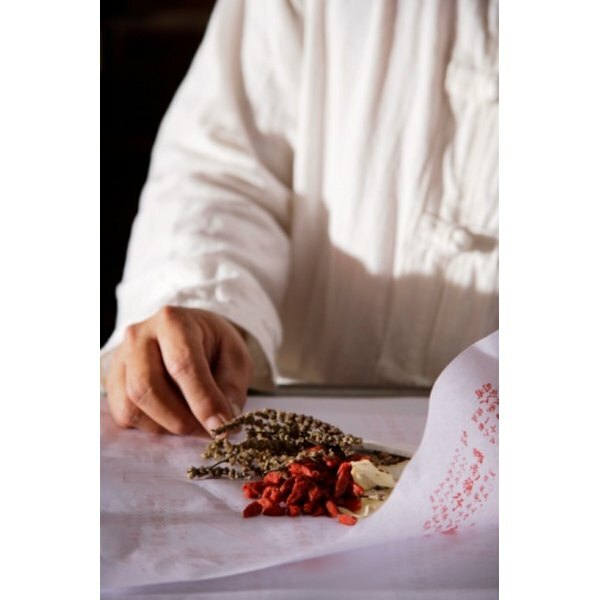 Are There Herbal Remedies for Muscle Spasticity? Muscle spasticity is a condition in which muscles are maintained in a state of tension by motor commands coming from the brain. A variety of herbs have shown muscle relaxant properties and calming effects on the nervous system that may help alleviate tight and sore muscles due to muscle spasticity. As with any remedy, consult your doctor before using herbs to treat a medical condition. Some forms of muscle tension can result from too much oxidation, according to Mary Harwell Sayler and Lori Siegel, M.D., authors of "The Encyclopedia of the Muscle and Skeletal Systems and Disorders." When this happens, take extra antioxidants, preferably in the form of fresh fruits, vegetables and herbs, to help reduce the oxidative burden in overworked muscle cells. Many herbs offer powerful antioxidant benefits, some in far greater concentrations than fruits and vegetables. Oregano, for example, contains more antioxidant activity than vitamin E. Other high-antioxidant herbs include bay, dill, coriander thyme and rosemary. Talk to your doctor about using oregano to help your symptoms. A homeopathic preparation of the herb arnica may alleviate the discomfort of sore muscles, says Adriane Fugh-Berman, M.D., author of "The 5-minute Herb and Dietary Supplement Consult." Arnica is a member of the daisy family and is also known as Wolf's bane or mountain tobacco. This plant is poisonous in regular doses but safe in homeopathic doses. Arnica has been shown to reduce inflammation, and improve blood flow to injured or bruised muscles. Fugh-Berman also notes antibacterial and antifungal properties of arnica, which can also help relieve muscle soreness that may be related to an infection. Consult your physician about arnica. The enzyme bromelain, found in fruits such as pineapples and papaya, speeds muscle healing from minor injuries by digesting and dispersing the products of inflammation, according to Judith Deutsch, author of the book "Complementary Therapies for Physical Therapy: a Clinical Decision-Making Approach." You might notice less muscle pain and swelling when you use bromelain. Deutsh also recommends the herb horse chestnut for muscle sprains to bring down swelling. Speak with your physician first. Kava kava, a Fijian herb may alleviate chronic muscle pain, says Gary Null, Ph.D., author of "The Complete Encyclopedia of Natural Healing." Kava has been used to treat anxiety and other tension-related disorders. The University of Maryland Medical Center cautions that kava kava may cause liver damage. Take kava kava only under your doctor's supervision. Chinese herbal medicine also offers relief for muscle tension and soreness. Tian ma gou teng yin, also known as Gastrodia and Uncaria, and tian ma mi huan su can relieve muscle spasms and lower blood pressure. Ask your health care provider about these treatments. Is Chamomile Tea Good for Cramps? What Vitamins Do Kiwis Have? Are Certain Spices and Herbs Natural Muscle Relaxers for Back Pain?